Guests at Megan Kiely Mueller’s wedding had no doubt about the importance of animals in the bride’s life. Wearing a collar of roses, Jett, her adopted black Labrador retriever mix, led Mueller down the aisle. 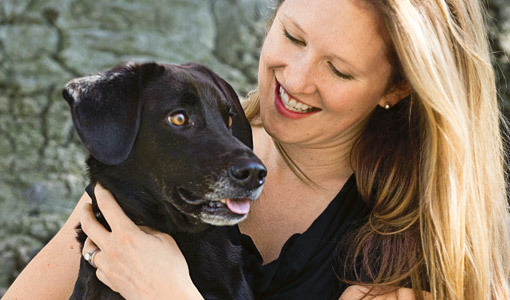 Close relationships with animals have been a constant in her life, and now Mueller, A08, G10, G13, who recently completed her Ph.D. in child development at Tufts, is focused on the science that underpins how animals and people help each other. 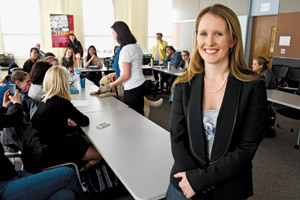 Her doctoral dissertation examines the ways in which human-animal interactions mold healthy development in childhood and adolescence—from building character to community involvement to success in the classroom. “People in general, and youth in particular, feel an incredibly strong, emotional connection to animals,” she says, “and understanding the nature of these relationships is critically important” for designing programs and policies that support positive benefits for people and animals. “I think this is an under-studied but highly significant area of human development,” says Richard M. Lerner, the Bergstrom Chair in Applied Developmental Science in Tufts’ Eliot-Pearson Department of Child Development, who was Mueller’s Ph.D. advisor. “We don’t have a rich developmental data set to understand the role of animals in promoting positive development or as a therapeutic tool, and not enough evidence from such research to build good programs in health promotion or disease prevention” or to shape policies to enhance animal welfare, he says. Mueller felt that power early on. She had a menagerie of pets growing up—cats, birds, fish—and she began riding horses at age 5. She competed on the Tufts Equestrian Team as an undergraduate and was named Intercollegiate Horse Show Association captain of the year. Her teammate, Stuart Mueller, E05, E11, not only shared her affection for horses, he fell in love with her. They married in August 2010 in Goddard Chapel on Tufts’ Medford/Somerville campus. At one time, Mueller considered becoming a veterinarian and tested the waters in high school by participating in Adventures in Veterinary Medicine, the Cummings School’s summer career exploration program. In the end, though, she decided she wanted to know more about the workings of the human mind; she earned a bachelor’s degree in child development and psychology at Tufts, followed by a master’s. Then, while attending a child development conference during her Ph.D. studies, she discovered a field that melded her devotion with a profession. Megan Kiely Mueller cotaught a child development class on human-animal interaction this spring. In the background, Perkins School for the Blind trainer Jennie Feinstein demonstrates one of the commands that her dog Norm has learned to assist his human companion. Photo: Alonso Nichols. Human-animal relationships conjure up familiar images—an elderly woman cuddling with her cat, a service dog helping his blind owner navigate city streets, a show horse in competition, animals on a working farm. The rewards of those relationships are commonly recognized, albeit mostly with anecdotal evidence. What is lacking, Mueller says, is the science—long-term and large-scale studies to produce the kind of evidence needed to guide human-animal interactions in ways that will benefit both sides. Since last summer Mueller has been part of an interdisciplinary team at Tufts, working on the project known as Integrated Health: Pets and People, which is staking out a research direction in human-animal interaction and perhaps even a new minor for Tufts undergraduates. The team includes faculty from the Cummings School, School of Medicine, the Eliot-Pearson Department of Child Development, and the Friedman School of Nutrition Science and Policy. They have expertise in human nutrition and obesity, overweight pets and animal nutrition, clinical psychology and animal behavior. “This type of research really lends itself to interdisciplinary collaboration in a meaningful and logical way,” Mueller says. This semester Mueller and Lerner cotaught a new course in Tufts’ School of Arts and Sciences called Human-Animal Interaction in Childhood and Adolescence. The course, Lerner says, generated “amazing” student interest. Typically, a new course attracts five students; this one pulled in 20. “I’ve taught a lot of new courses in the past 14 years, and I’ve never had a response like this,” he says. The course explored how human-animal bonds can lead to positive development in children, families and communities as well as produce benefits in therapeutic settings. (Animals, especially dogs, often are used in therapy to reduce stress, heighten positive feelings and encourage communication and socialization.) The course also examined how an animal’s interactions with people affect its well-being. “For animals that are participating in animal-assisted therapy, we need to ask: Is this a stressful experience for them, or not?” Mueller says. “How can we better measure that” and use those findings to create the best experiences for the person receiving therapy and the animal that is assisting? A blindfolded Emily Zhang, A16, gets to know Norm. Photo: Alonso Nichols. Now a research assistant professor at the Cummings School, Mueller is leading a study about how animals affect youth in military families who often have to cope with multiple moves and school changes. The study, funded by Pfizer, is examining such issues as the role of pets in promoting coping skills, creating a source of social interaction and reducing stress. Her doctoral dissertation, which evaluated how human-animal interaction promotes healthy development in young people ages 18 to 26, has already identified some benefits of such relationships. “I found that emotional attachment to animals was associated with higher levels of caring behavior toward others and connection to family, school and peers,” she says, in addition to higher engagement in contributing to their communities by taking leadership roles, participating in community service and helping others. Youth who were involved with animals also scored higher on measures of positive character attributes and lower on measures of symptoms of depression. She also found that adolescents living in urban areas were half as likely to own a pet or engage in an activity that involved animals than those in more rural areas. Mueller’s assessments were based on data from the 4-H Study of Positive Youth Development, research sponsored by the National 4-H Council in which Tufts has participated for more than a decade and with which Mueller worked as a doctoral research assistant at the Tufts Institute for Applied Research in Youth Development. The study has surveyed more than 7,000 adolescents in 42 states to determine the impact of 4-H programs on future success, from healthier lifestyle choices to academic achievement to civic engagement. Linda Hall is a freelance writer in Hopkinton, Mass.